This is a triumphant first feature for Shunji Iwai, the most delightful film that I saw at the 1995 Toronto Film Festival. So be forewarned: the following is a bit of a rave. A contemporary Japanese love story, about two women who loved the same man, who write letters to each other about him and discover in the process that the past isn't what they thought it was. It's an intimate story, but filmed in a breathtaking wide-screen format. There are two different characters who share the same name. And a single actress, Miho Nakayama, plays two different characters. And these two pairs partially overlap (don't worry; it's supposed to be a little confusing, at first). It's sweet, a little sentimental, perhaps -- romantic high-school girlish, but in a good way --, sometimes ecstatic, a bit suspenseful, and often gently funny. Miho Nakamaya's performance is superb: finely shaded and balanced, it animates the entire movie. The music is an incongruous mishmash of references to Mahler, Ravel, Bach, Joni Mitchell (? ), and Gershwin, but it works, beautifully. Love Letter's editing and cinematography deserve top billing, along with its director. The filmmakers joyously deploy hand-held wide-screen photography a year before Lars von Trier made it fashionable. There is a dazzling amount of rapid-fire cutting, though not of the look-at-me MTV style; the editing just authoritatively, and gracefully, expresses the attenuated-dreamy mood of the whole piece. And echos a theme of the film, that "points of view" can be manifold, richly dispersed, yet still somehow (magically) coherent. Sure, there are issues of memory/reconstruction, identity/fragmentation (Proust's Remembrance of things past figures prominently in the plot)..., but it would spoil the fun, in a way, to dwell on them. We've seen some of the same elements, deployed less successfully, in Shusuke Kaneko's Summer Vacation 1999. Wong Kar-Wai's Chungking Express kept coming to mind, too: for similarities in mood and theme. 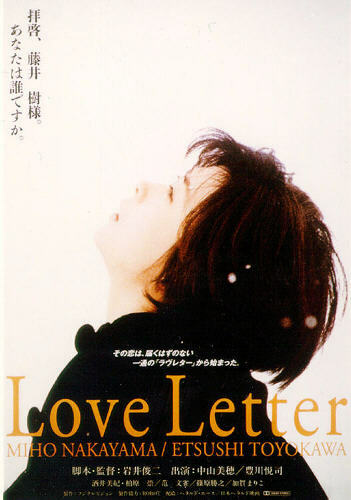 If you were charmed by that film, then you shouldn't miss Love Letter (and vice-versa, I suspect). I cried several times during the movie (not my usual practice).